It's been nearly two weeks since the release of the Laws of War DLC. As of now, we're still evaluating all of your feedback and impressions, and we're also investigating whether we need to deploy a small hotfix. Meanwhile, we're also very much in active production for the two remaining DLC on our current Arma 3 Roadmap: Tac-Ops and Tanks. The most significant happening in the Armaverse these past two weeks must have been the Laws of War DLC release! We're incredibly proud of the end result, and we're absolutely thrilled to see all of your reactions! 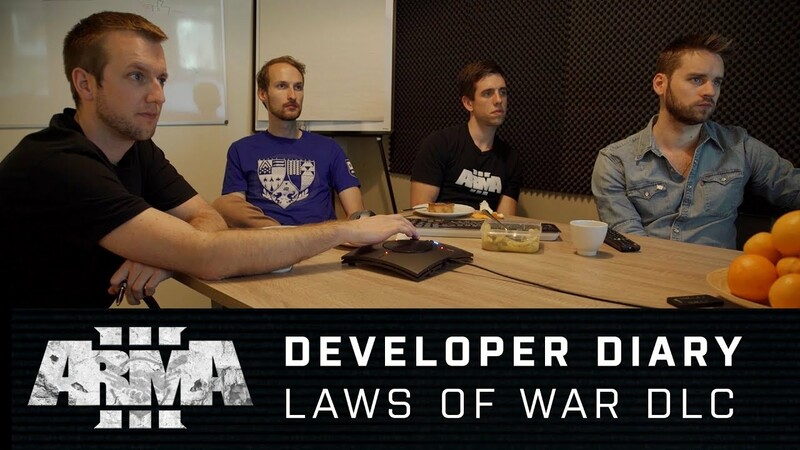 In celebration of its release, and to introduce the DLC further, we published a new developer diary video featuring the DLC's Project Lead Joris-Jan van 't Land and Arma 3's Creative Director Jay Crowe (and a guest appearance by Christian Rouffaer from the ICRC). We'll have more intel on Laws of War later in this SITuation REPort. Last week we celebrated another major milestone: four years of Arma 3 since its official release on Steam! To mark this ocassion, Creative Director Jay Crowe published a splendid blog with a retrospective of Arma 3's journey thus far. In it, he looks into the (rather turbulent) history, and points out some defining crossroads in the game's development. It's a splendid read for anyone interested in Arma 3's life until now (and possibly perhaps maybe some witty writing that probably only the British will really understand!). For us lucky developers, the Armaversary celebrations even went beyond the blog. Since our very own Bohemia Tank (nicknamed "Edita") needs to stretch her metal tracks every once in a while, we figured this would be the ideal opportunity and we took her for a ride. Aside some rather brutal ploughing of a nearby field, Edita conducted herself perfectly. Speaking of conducting, we also still had one more surprise up our sleeves. Originally released as audio tracks alongside the free Malden DLC back in June, this Armaversary turned out to be the perfect moment for us to release video footage of the orchestra recordings. As this was the first time for us to use an orchestra, our Audio Lead Jan Dušek explains some of the motivations: "It was my honor to lead this live orchestra recording project and to cooperate with all of those great musicians, who showed not only their passion for music, but also for video games! I believe this would be a wonderful gift to all fans of the Arma series, including those with fond memories of our very first game. Instead of outsourcing this to a third party, we decided to lead the way ourselves. With great help from Varhan Orchestrovič Bauer on the score rearrangement, recording session, and mastering process, I believe we managed to provide a truly unique experience to you. It also fits in with our long-term plans to push all aspects of our audio forward. And even though these tracks are not used in the game directly, we definitely learned a lot from the overall process. With the great feedback and support we've received so far, we're determined to keep improving the audio immersion by not only by updating our audio engine but also by using live music as much as possible. Stay tuned!" There is a playlist on YouTube where you can view and listen to all of the live orchestra recordings. Enjoy! YouTuber/streamer, and Zeus Game Master extraordinaire, Luetin09 shared a video on YouTube which summarizes his perspective on Arma 3 and its development. He starts with an outline of his own introduction to Arma 3, and then goes through the various major updates and DLC, and their influence on the game and even gaming in general. Luetin09 really captures what makes Arma 3 so special. We'd like to thank Luetin for the enjoyable and inspirational video. For those interested, the narrated part starts around the three-minute mark (after some hilarious gameplay bits). Together with the Laws of War DLC, we released Update 1.76, which introduces a number of platform improvements, tweaks, and fixes. This platform update was the result of weeks of internal preparations and public Release Candidate testing. While we're still tracking issues, the preparation lead to a very solid update, and provided a nice benchmark even for future releases. The Arma 3 Tools package was also updated with some major UI improvements. Feel free to inspect the update pages for both the game and Tools. One of the key components of the recently released Laws of War DLC is without any doubt the humanitarian NGO faction: IDAP (International Development & Aid Project). To introduce the motivations and development behind this new (fictional) faction, our Artist Pavel Valič wrote an OPREP to discuss the main assets from the Art department's perspective. This includes the Utility Drone and the Van (and reveals some undercover resource hunting by the DLC Project Lead Joris-Jan van 't Land). The OPREP offers an interesting peek behind the curtains of asset creation, so be sure to check it out! But there's more LoW DLC reading material for those interested. Motherboard conducted an interview with Joris-Jan and Jay to learn more about the in-depth motives and specifics of bringing a humanitarian aspect to a military game. We've also published some treats connected to the LoW DLC. There are new wallpapers available for all of you screen decorators. You just need to pick the best fitting resolution on our website. Owners of the Arma 3 Digital Deluxe Edition, Supporters Edition, Apex Edition, or Special Edition (or any of the Arma 3 editions that include the digital extras) will find a few nice additions in their installation folders ('Bonus' subfolder) and Steam music players in the form of the Laws of War music tracks! You can now even apply a Laws of War theme for the Arma 3 Launcher via the Launcher's Options. Last but not least, for those who were not yet aware, half of Bohemia Interactive's net revenue from direct sales (not as part of bundles) of the Arma 3 Laws of War DLC in 2017 will be donated to the International Committee of the Red Cross (ICRC). The total amount raised will be announced on bistudio.com in 2018. Now that we've turned most of our focus onto our next Roadmap goals, it's also fair to briefly address Arma 3's future. For example, our Dev-Branch ninjas might have noticed that the number of daily additions has decreased over these past weeks. This is simply because, even though we still support Arma 3 with a dedicated team of developers, we also need to steer some of our efforts into the direction of developing key new technologies, such as the Enfusion engine. This means that, aside from a couple of new features as part of the Tanks DLC, you should not expect any massive changes to Arma 3's core platform moving forward. However, there's absolutely no need to worry about Arma 3's future, because we still have people dedicated full-time to fixing bugs and increasing stability. Plus, we'll still be adding more content in our upcoming DLC - and of course not to forget all the amazing mods and addons that are still being released by our community on a daily basis! There was a major update to Arma 3's experimental Mac/Linux ports last week. This brings it to the 1.70 game version, which means it now supports the 64-bit game executables and adds the Jets DLC content along with its platform improvements and additions. The Mac version now also supports Metal. In cooperation with our external partners at Virtual Programming, we plan to start working on updating these experimental ports to the current main branch release (1.76) soon™.